At the beginning of my intentional journey into emptiness, I wrote in my journal: So much of life’s activities seem to be preparation for something else, a kind of infrastructure. We need to fix the bulkhead on our house, prune the vegetation in the yard, make a will to protect each other when we die, do the dishes and the laundry, and so on. I wrote down a whole list of unfinished projects. I am sure if you had five minutes of silence, and a pad of paper, you could fill in your own current list of unfinished projects. My journal continued: If “everything else” was done—the whole list of infrastructure projects—what would I like to be finally doing then? What are we preparing for? What is at the center? Sometimes I meditate, to feel centered for the rest of the day. But then that also seems to become so much preparation for something else. What is the something else? Is there something at the center? What is worth paying attention to? The yard right now reminds me of my life because it is being taken over by invasive species. When I look at it, I feel a sense of clutter there, too. I feel clutter within, and clutter without. So, the first step on my journey into emptiness was an attempt to clear out some of the outside clutter. When I woke in the morning, I would gravitate in the direction of some cleaning project or another. I cleaned out my office at home. 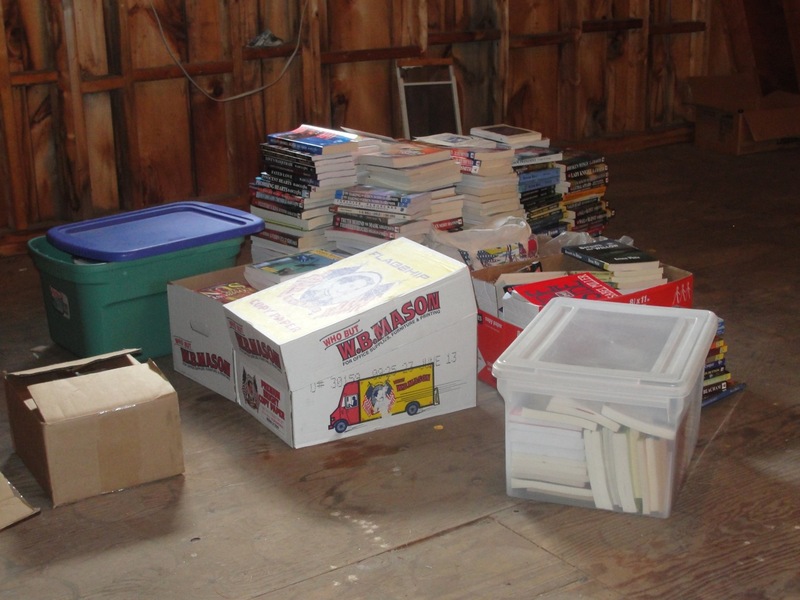 I moved books I wasn’t using from the bookshelves into the basement, to make room for the books I was using, that were stacked all over the floor. I cleared the surfaces of my dresser, of the desk, of the floor, sorting and putting away paper. Another day, I worked in the yard, to try to clear out some of the bittersweet, wild roses, and raspberry bushes that had formed an entanglement over our leach field. But after a while, I realized that I could spend my whole vacation just working in the yard, or just doing various house projects. It wasn’t even possible that I would get to the end of the list. Even if I did, I wouldn’t find what I was looking for. But I needed to do some of it. If there was too much outside clutter, I couldn’t find the space within for what was most important. Do you feel your life is full of outside clutter, surfaces that are full of paper or books, projects that you can’t get to? Part of a journey into emptiness might to clear out some of that clutter. Try taking one area and see what happens if you clear out the clutter there. This entry was posted in Awake to Mystery and tagged Clutter, Emptiness, Mystery, Soul, spiritual practice, Spirituality. Bookmark the permalink. aye aye aye, you’ve been sneaking into my house while I’m away. It describes me exactly. Even y computer is like that, all kinds of pages open, learning, writing, doing ten things at once.